Welcome to Marvel Strike Force Heroes page. This is the full description of MSF Night Nurse stats, skills and abilities. Night Nurse is a City Supporter with best healing abilities in the game. Her first skill inflicts medium damage and has a 50% chance to apply Slow for 2 turns. Her second skill heals the lowest Health ally for a large amount of Health. Night Nurse ultimate heals all for 2500 Health and 10% of healed ally health and additionally applies Regenerate to each ally for 2 turns. Her passive also has a chance to heal a small amount of Health to ally each turn. Night Nurse is the best healer in the game currently and she is irreplaceable in raids, so everyone should farm her sooner or later. Her price is 45 shards obtainable through Premium Orbs, Mega Orbs, Hometown Heroes Orbs, 5-9 Heroic Assemble Campaign mission, and 3-9 Villains United Campaign mission. What are Night Nurse’s stats? 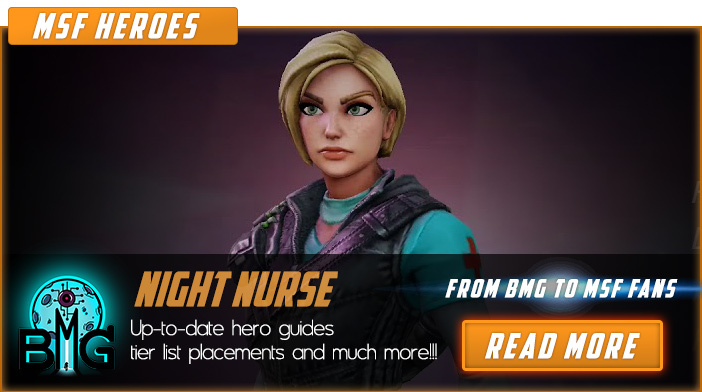 We hope that you enjoyed the description of MSF Hero Night Nurse. For detailed information about other MSF Characters check our MSF Heroes page.